The ultimate Trivia App for the ultimate Country Music fans! With 100 questions we more then double the questions that other trivia apps offer! Not to mention our numerous features that most don't consider! Test your skills against the world in Country Music Trivia! 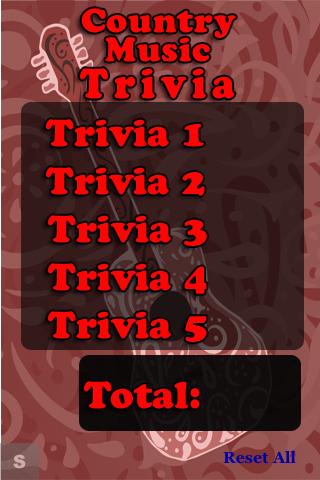 We present you with a fun, interactive, and feature rich Trivia Game. 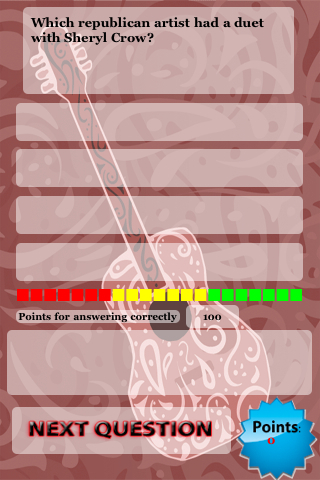 - 100 Questions all about Country Music! - Resume Game for those interrupted by a phone call or would simply like to finish later. - Countdown meter starts at 100 points and falls with each passing second. Hurry to make your correct answer to maximize your points. Not sure of the answer? Just wait and potential answers that are incorrect will be removed to help narrow down your selections (all while your potential points are diminishing). - Leaderboard setting so you can post your score to our Global Leaderboard and compare how you rank. If you enjoy other apps like Trivia Master, Mr. Trivia, Wheel of Fortune, Quizner's, Who Wants To Be A Millionaire, Twilight Movie Trivia, The Price Is Right, A Twilight Trivia, Deal or No Deal, Smarter Than A 5TH Grader, Brain Challenge, IQ-Test, 1 vs 100, New Moon Book or Trivia, Twilight Trivia, Brain Tuner, Pop Quiz, PopQ Quick, or any of the popular trivia games we recommend you try our Trivia apps as they are fun, feature filled, and you can compare your score against other players around the world in our Global Leaderboard!